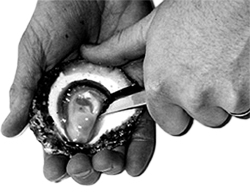 The shapes of the knives are specially designed for opening oysters in a safe, fast and easy way. 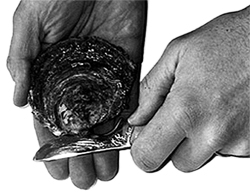 Follow the steps below to opening oysters with Helgess oyster knife. 1. 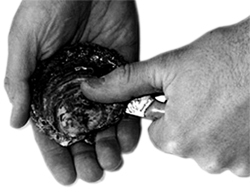 Hold the oyster with the flat side up. 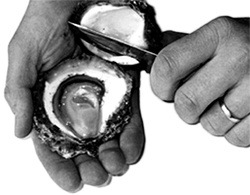 Push the straight blade into the slot at the oysters joint. 2. Cut the muscle that is under the top shell. 3. Turn the knife up against the shell to avoid shredding the meat. Pry the shell. 4. Lift off the top shell. Asure that the oyster smells fresh. Cut off the meat from the shell. 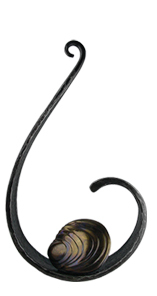 If you have the double bladed knife use the curved end of the knife to cut the muscle.